This is a great way to turn leftover pork, beef or chicken bbq into a wonderful new dish. Rub the potato with the olive oil and sprinkle with the sea salt and place in the middle of the oven to bake. Bake for 45 minutes and test the potato by squeezing (use a clean potholder or cloth so you don't burn yourself). If the potato gives, it's done. If you're cooking more than 4 potatoes, increase the time by 15 minutes before checking. When cooked, remove from oven and allow to cool for at least 10 minutes. Slice the potato in half and scoop out some of the potato leaving a nice pocket to place the bbq. Brush the potato halves with the melted butter and place back in the oven to crisp. It takes 10-12 minutes. Start by putting the potato cut side down and half way through, turn the potato over. Place back in the oven until the cheese has melted and has just begun to turn golden brown. Serve with sour cream garnished with chopped chives. 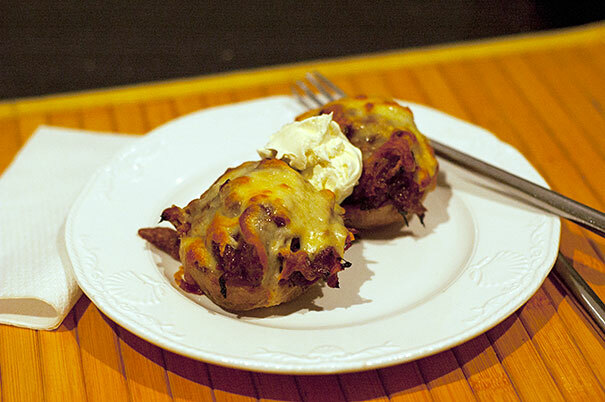 You can bake small chat (baby) potatoes and fill with bbq for a wonderful appetizer.